Who is it for? 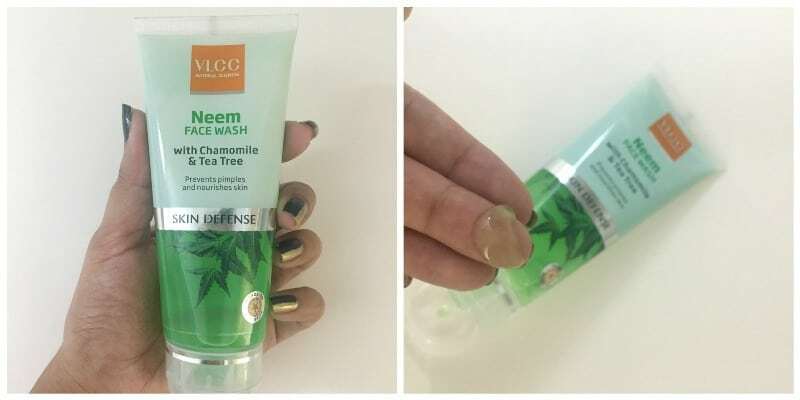 VLCC Neem Face Wash with Chamomile and Tea Tree is good for all skin types, especially sensitive or acne-prone skin. Take appropriate amount and apply on moist face and neck, massage gently, avoiding eye area in a circular motion to work up a lather. Rinse off with water. Use daily. No, but advisable to avoid contact with a delicate area under the eyes. This face wash comes in a transparent plastic tube, with a flip to open cap. All necessary details are mentioned on the back of the tube. It is in form of a green translucent gel. One needs to work it up with water well to get a smooth lather. It is not too runny or thick. It has a mild plant like fragrance, especially like neem. This face wash cleanses the skin by removing excess oil without over-drying the skin. I used it for a week and felt that it does control oil/ sebum secretion for quite some time. However, I have had acne issue since forever and did not control or reduce my pimples, as it claims to do. It doesn’t over dry the skin and applying a light moisturizer afterward would be enough. It is mild on the skin but contains quite a lot of chemicals like parabens, SLS, perfume etc, which was quite disappointing because I had always thought that VLCC products were chemical free. Does not make the skin dry. Did not do much for my acne. It is a mild face wash and is good for people who do not have acne or pimples regularly. But sadly it did nothing for me and I am let down with all the chemical ingredients. So I will not repurchase or recommend it. Yup the mildness of it, is the only good thing!